Fluoride is used in dentistry to help keep your enamel, which is the outer layer of your teeth, strong and to help prevent cavities from forming. Keeping your children’s teeth healthy and bright requires the use of fluoride. Many children do not get enough fluoride and because of this, their teeth are more prone to developing cavities. Fluoride treatment is easily done in the office and simply requires brushing a topical treatment onto their teeth in one quick swipe. The treatment is done at each of their dental appointments and is completely safe for them to have done. 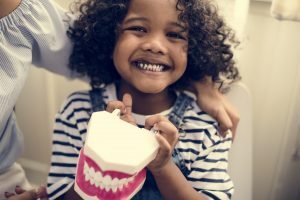 What is Pediatric Fluoride Treatment? Pediatric fluoride treatment is done to prevent decay from developing. The fluoride helps to strengthen the teeth, which in turn can help prevent cavities and having more extensive procedures done. Plus, because the treatment is done right in the office and is quick, your child won’t even know they’ve had it done. Why is treatment necessary for children?